With nearly half (47%) of manufacturers planning to invest in digital technology solutions in the next 24 months, now is the time to determine needed competencies, ramp up recruiting, and bolster training of both new hires and incumbent workers. This latest Smart Manufacturing Report focuses on the importance of a learning culture, and how manufacturers are developing a “smart” workforce to drive business results. A quarter (25%) of companies consider lack of corporate leadership to lead and plan a smart manufacturing strategy a primary barrier that prevents or slows the adoption of digital technologies. Just as leadership commitment is essential for implementing digital transformation, senior management must develop a learning culture, providing the vision — and support for — a workforce development plan to support the new initiative. A second barrier cited by manufacturers (28%) was lack of skill set to oversee and manage implementation. “The vast amounts of data being collected across the various manufacturing system hierarchies will create needs for new types of manufacturing skill sets where workers at all levels are savvy in instrumentation, sensing and actuation, data analytics, computer science, and systems engineering practices,” said Al Sanders, Ph.D., president and owner of Design-Vantage Technologies LLC. He added that smaller manufacturing companies likely lack a legacy organizational structure and the workforce skill sets required. “Providing manufacturing IT training and certifications for OT professionals (operators, technicians, manufacturing engineers, industrial engineers, etc.) and OT training and certification for IT professionals (network administrators, IT engineers, etc.) could address the knowledge gaps present in each discipline,” Sanders said. 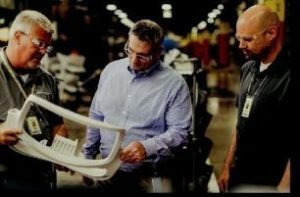 Forward-thinking manufacturers are investing in training programs and using competency models to build the capabilities they will require to remain competitive. It starts with putting a system in place to codify knowledge and skills required for job roles, aligned with training curriculum, and tied to business goals. For instance, manufacturers are using competency models such as Tooling U-SME’s Competency Framework for Manufacturing Excellence, to assess and build knowledge, skills and abilities, as well as create clear career pathways for employees. This structured approach to workforce development promises consistency when building high-performance team members to meet the demands of the Industry 4.0 economy. The bonus is that innovation comes when a workforce is fully immersed in the technology. Workers can then make connections, and envision improvements or completely new approaches to problems. For Arizona based LAI International, a premier provider of highly-engineered, mission-critical components since 1937, smart manufacturing started off as a natural extension of business as usual. “All projects at the company tie to five basic premises,” said Patrick J. “P.J.” Gruetzmacher, Chief Executive Officer and President, LAI International. The company developed a beta test case and rolled it out across one line. “From a cultural perspective, boy, did we get resistance,” Gruetzmacher said. “We failed miserably because people had options. I couldn’t get the team to buy in. “We’re gonna burn the bridge behind us,” Gruetzmacher decided, confident in the new system that had been validated through beta testing. LAI literally ended the old system by flipping the switch. “We stuck to our guns and we made sure we put a bunch of resources out on the factory floor, and we trained, trained and trained,” said Gruetzmacher. Find champions. These are informal leaders that become the “go to” people, who adopt the technology first and start to show others how to use it. Prioritize team feedback. Once the LAI teams started using the new technology, they quickly began suggesting additions and changes. “We took whatever they recommended and put it right at the top of the list. We turned it from a push project to a pull project where people were trying to pull it into their lives and it ended up being fantastic,” said LAI’s Gruetzmacher. Keep training. With each change, LAI does more training. “We follow up and make sure everyone’s good with it,” said Gruetzmacher.